When performing Baseball Infield Drills, fielding ground balls is a standard element, but we can’t get too hung up on only fielding, because there are many more aspects to playing infield than merely catching the ball. I’m going to teach you three (3) drills which will not only improve your players’ skill level, but will keep the practice quick and fun. Infielders, much more than their outfield counterparts, must have quick hands. 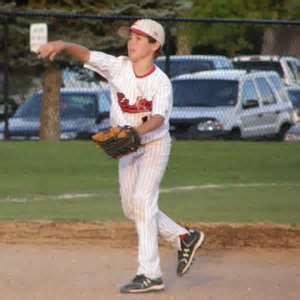 The speed of the game within the infield requires the ability to quickly retrieve the ball from the glove and throw it. That’s the reason infielder gloves are much smaller than outfield gloves, to assist in quickly locating the ball instead of fumbling for it within the deep web of the glove. (6.) If a throw is wild, the count reverts to zero. (8.) Have 1 line rotate players to the right, making new partners and repeat the drill. (9.) Perform this drill until every player has had a different partner, and preferably 3 or 4 times, with a brief rest period between new rotations. The intent of the drill is simply to train fielders to get the ball out of their glove and thrown to the intended base, player, as quickly as possible. Speed is of the essence, but accuracy is also a must, thus the losing all their points and going back to zero for a wild throw or dropped ball. Thirty seconds doesn’t sound very long, but when you’re fielding and throwing as quickly as possible, it seems like a long time. You can of course make the time longer, it’s the coach’s discretion. Watch for a player who is concentrating more on accurate throwing than the quickness portion and encourage him to pick it up. 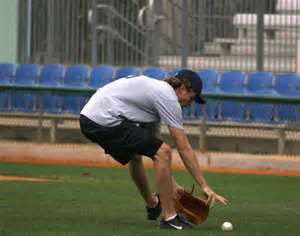 Whether it be infield or outfield, there will be times the baseball ends up in no man’s land and must be retrieved. Since the ball is assumed to be in fair territory, the runner(s) are moving around the bases as quickly as they can, therefore the need to get to the ball and get it back into play as fast as possible is important. The intent of this drill is to teach players to get to the ball ASAP, and with their back to the play, turn, locate and throw to a particular spot. (8.) As soon as the fielder catches the ball, left or right, the next runner in that line can take off for the baseball. (9.) Perform this drill through the entire team at least 3 times. 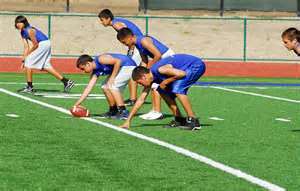 Football teams from Pop Warner to the NFL have offensive and defensive plays designed and practiced for 2 minute drills, essentially the end of the game equal to the last inning in baseball. So why don’t baseball teams have such drills? Well, in my opinion they should. I’m going to offer a few last inning scenarios which a coach can set-up and practice. These drills do not have to be practiced to perfection as they may only occur every now and then, but the important part is the amazing memory retention of the brain. Although you may only spend a portion of the practice on these drills, the mind will retain the actions practiced, and when and if the situation arises, will immediately recall the motions. Players may not be able to execute the play to perfection, but there will be no confusion as to what to do…. A Huge Advantage. 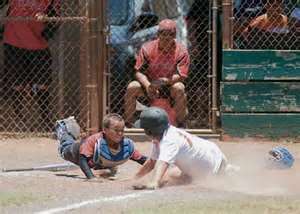 All scenarios are the bottom of the last inning with winning run on base. The scenario is there is 1 out, runners on first and third, and the possibility of a squeeze play exists. Position your corners, third and first baseman, 3’ to 4’ in front of their respective bases closer to home plate. The middle infield, shortstop and second base, are at half depth, (even with the base path) catcher and pitcher are at their position. (1.) Hit a ground ball to the third baseman, who should charge the ball and throw home. Be sure the player starts out low and remains low, not straightening to make the throw home, throughout the play. (2.) Repeat this play to the first baseman, insuring he also stays low. (3.) Hit a hard ground ball to the shortstop, he must decide whether to charge the ball and throw home or attempt the double play. Then hit a slower ground ball which forces him to attempt the double play. (4.) Repeat this same drill to the second baseman. (5.) Hit or bunt a come backer to the mound. The pitcher must decide, depending on the speed of the ball, whether he must flip the ball to catcher or should he run at the runner cutting him off for the tag out. (6.) Bunt a ball out in front of the plate having the catcher go out and field it, then depending on where the ball is, set up to block the runner and tag him out, or dive for the tag out. c. The infielders calling squeeze and the pitcher throwing a pitch out. This is only the tip of the iceberg regarding baseball infield drills, but it’s a great start.